Singer, songwriter, and Beatle, John Lennon didn't meet his fate at the hands of a deranged fan, according to a book; instead, his killer received training from the CIA and other U.S. Intelligence agencies — and not for his music. Author John Potash claims the U.S. government wanted Lennon erased for his robust influence promoting what it deemed "radical leftist" ideologies. In essence, dissenting opinion coupled with massive popularity brought to fruition Lennon's killing. But United States Intelligence mavens didn't shake perturbance with dissent after Mark David Chapman ended Lennon's four decades of life with a hail of gunfire outside the penultimate icon's New York City apartment on the night of December 8, 1980 — Potash insists the CIA pursued both epochal rapper, Tupac Shakur, and grunge rock legend, Kurt Cobain. Described in news reports as a rabid, psychotic fan, 25-year-old Chapman landed a sentence of 20 years-to-life after pleading guilty to second-degree murder. Lennon's murder has since kindled countless putative 'conspiracy' theories, including many mirroring that proffered by Potash in his incendiary book, "Drugs as Weapons Against Us." Potash, according to Express, writes that Lennon's ostensively untenable activities included spearheading anti-war demonstrations and a benefit concert to free imprisoned activist, poet, and similar U.S. government target, John Sinclair. Sinclair's radical beliefs and actions — which included founding the revolutionary anti-racist White Panthers — also shook the war-mongering establishment to the core, and the Flint, Michigan, native ultimately succeeded proving he'd been the subject of illegal domestic surveillance to the U.S. Supreme Court in 1972. Lennon's turn from drugs toward the anti-war movement and political activism, Potash writes, reaped grave concerns from the Intelligence Community — which saw the ex-Beatle's unhindered clout over youth as a threat to the U.S. agenda abroad and at home. Lennon, a native of Liverpool, had just one month remaining until U.S. citizenship would be granted when Chapman took his life. "This exemplified the international interest and influence of Lennon, underscoring why his leftist activism was a threat to the CIA and the oligarchy," Potash explains. "The book recounts an investigation by former Sunday Express legal correspondent Fenton Bresler, who obtained classified documents from the FBI and CIA," Express reports. "The documents were said to show the star's arrest for drugs use in 1972 was 'to neutralise and disrupt' his activities. 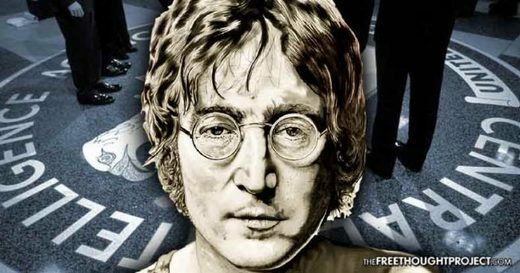 They suggested Lennon was tracked by the intelligence agencies during the 1970s." One of the most salient, if explosive, claims detailed in the book surrounds Chapman's alleged CIA training in Beirut, Lebanon, where — with a hefty population of Palestinian refugees, and as that nation spiraled into heated conflict — the U.S. spy agency had a massive presence, in the years surrounding Lennon's murder. "He could have escaped but instead took of his coat, folded it up and took out Catcher in the Rye out of his pocket." "Catcher In The Rye was part of Chapman's hypnotic programming, a trigger that could be 'fired' at him by a few simple keywords [via] a cassette tape message, telex or telegram or even a mere telephone call." In a previous interview, NYPD Lt. Arthur O'Connor told Bresler, the Sunday Express journalist, "Chapman looked like he could have been programmed and I know that you are going to make of that word. That was the way he looked and that was the way he talked." A spokesman for the U.S. Central Intelligence Agency unsurprisingly asserted to Express the claims in Potash's book are 'baseless' and do not warrant consideration. However, to the untold numbers comprising Lennon's perpetual fan base — and to all who champion the right to dissent and the imperative of liberties in the Constitution delineating as much — accounts like Potash's provide resounding confirmation the government does not, and will never, abide being crossed.